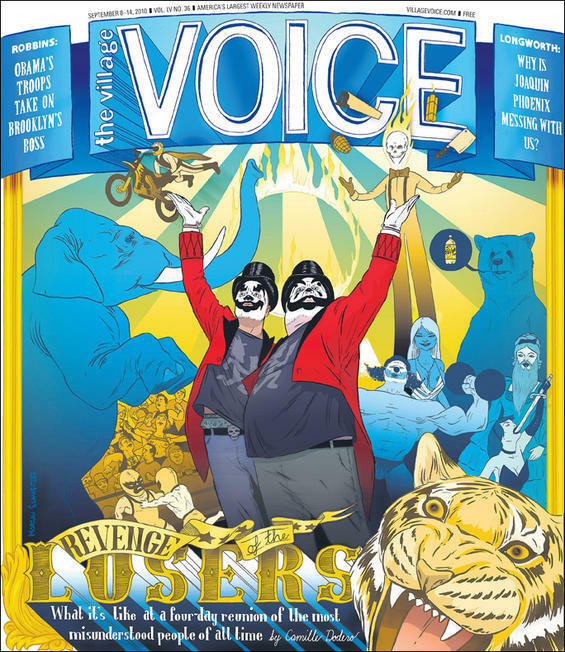 The cover story on the Gathering of the Juggalos that I worked on came out in yesterday’s Village Voice. If you live in NYC you should pick one up. It is a pretty amazing adventure tale written by my editor Camille Dodero after we spent four days in the middle of nowhere surrounded by killer clowns. It’s 6000 words so it takes commitment to read it, but it is very enjoyable. I have been working for VillageVoice.com for two years but this is the first time that I have worked on a big cover story for print like this. Even though I didn’t shoot the actual cover I do have nine pictures in the article which is pretty substantial. Anyway if you don’t live in NYC and can’t pick up a paper you should click here to read the story online.